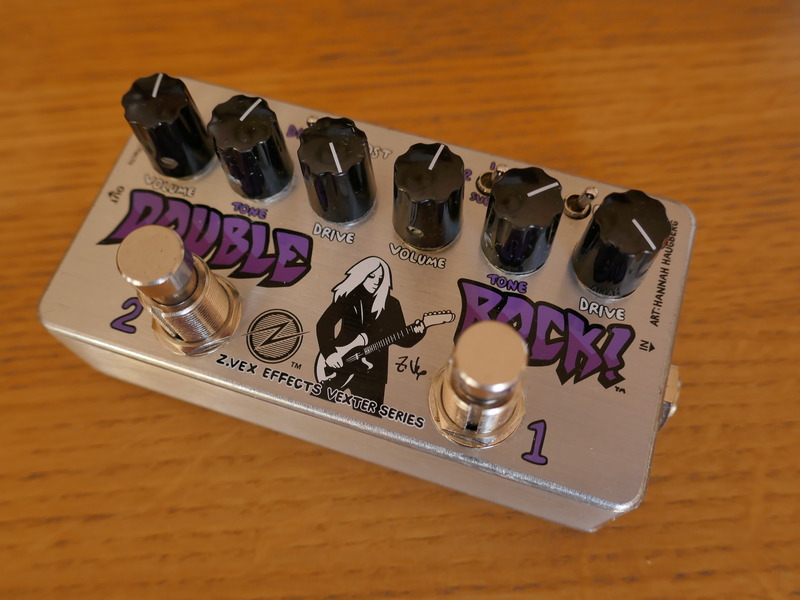 Super Hard-On, Guitar/Bass booster from Zvex. xxmartinxx's review"One bright clean boost"
- 9 Volt adapter requires modification or replacement bottom plate. You plug it in, you press the footswitch, it boosts your signal. You turn the knob, it crackles and further boosts your signal. It doesn't get much easier than that. I think this pedal could greatly benefit from some equalization knobs. Read further. This is a very hi-fi sounding pedal. It is also very bright and not at all transparent. Almost, sort of like an instant VOX AC-30. If that's your thing, this might very well be a pedal you will fall in love with. 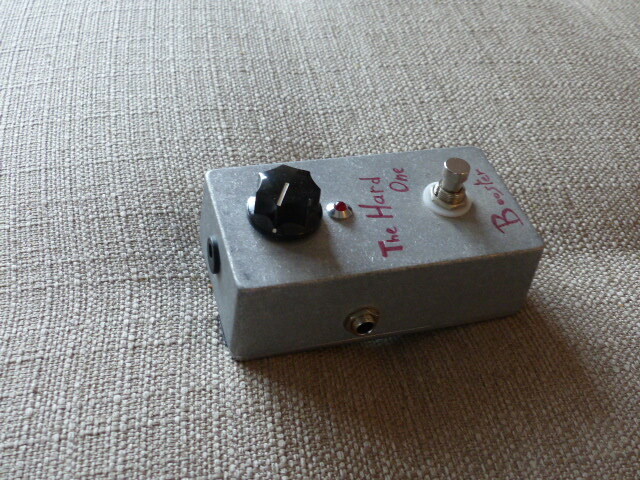 If a take your head off bright sound is not your thing, you probably would not like this pedal. Unfortunately, due to lack of volume control or any equalization this pedal is the definition of a one trick pony. If this pedal had any flexibility it would be one of the cooler boost pedals out there. Since it does one thing, I find it almost useless as a boost pedal. The best you could do is run it all the time and EQ your amp. I can't imagine running this pedal as something you kick on while playing due to how might treble the pedal adds with no ability to adjust it to your guitar and amp. 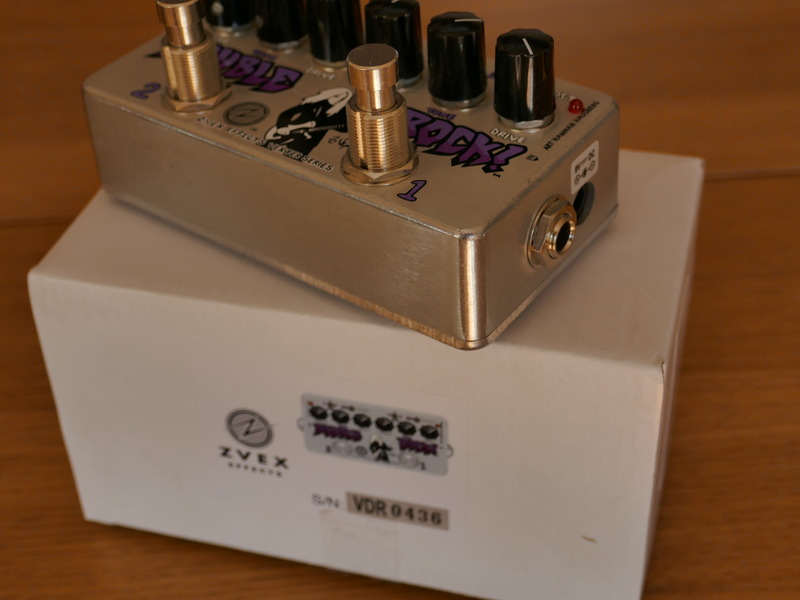 As with all ZVex pedals, you are paying a bit for the custom paint job. I know that they now have silk screened version that bring the price point down, but not nearly enough in my opinion. This pedals should be about half the price is currently is. There are so many great options for a boost pedal, I simply don't see how this one can complete anymore. Try before you buy. Very simple ad easy to use unit. If you think you have a weak sounding guitar and or weak sounding pickups then this might be the pedal for you. With only one knob and two outputs for different amps or a tuner out there really isn't much to think about. Just plug it in and listen how it reacts to your guitars output and boost the natural frequencies of your guitar and pickups. Most vintage guitars suffer from steadily deteriorating magnets in their pickups, since permanent magnets aren't really forever. The Super Hard-On's input impedance is so high (5 Meg) that it refuses any current flow from your pickup... maintaining the most magnetic field around each string, so you can hear exactly what your pickup sounded like the day it came off the winder. The box is hand-drilled using no petro lubricants, and hand painted so that every box is unique. Knobs are Harry Davies, made with the same molds they've used since the fifties. Each effect is hand dated and signed by Zachary Vex. I love the clarity it can give you when you run the control knob around 9:00. It really gives a nice sweet volume and transparency. Turn the knob up to 12:00 and you will get a nice mild overdrive signal that works very well in front of an already overdriven amp. It is subtle but sounds great in front of a Marshall JCM 800. If you turn the control knob all the way up it gets a nice tubescreamer type overdrive which is mild and classic sounding. When it is maxed out it does get a little fuzz tones in there which is very cool and unique. Like all Zvex pedals this is built quite well and will sound excellent through just about any source. At new these unit come in at around $240 a piece. Not a bad price for a solid built and sounding booster pedal. And for what it does it does quite well. Some people might think why would someone pay for a one control knob unit that just increases the volume, but if you got the chance to plug this thing in you would immediately hear the reason why this pedal is fantastic. I would recommend this pedal to anyone who needs a bit of a boost to their signal or feel that the pickups or guitar sounds a little weak. This will give you the clarity and gleaming tone that you find on mixed and mastering recordings. 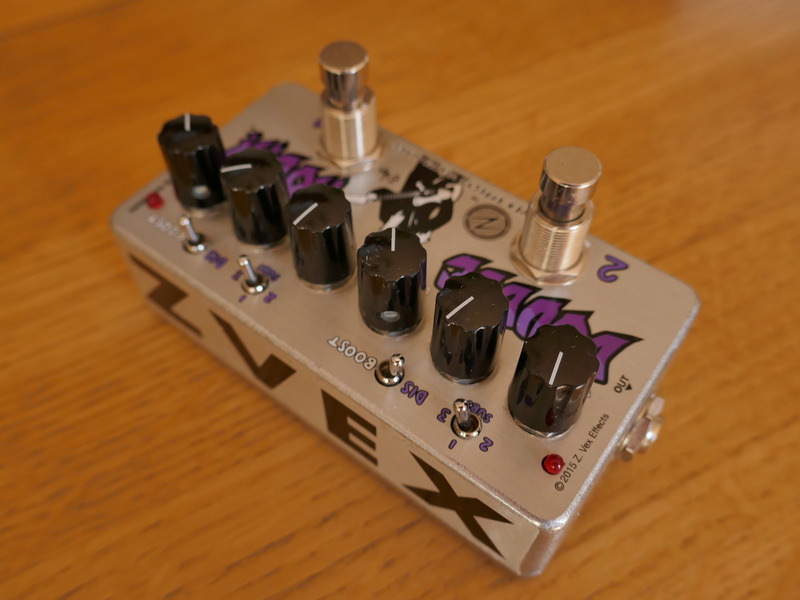 Booster Zvex made and hand painted. The object is beautiful. An input jack and 2 sortie.On can be used as booster 2 amps simultaneously. When active this pedal and allowed the knob to zero does not change and does not color your sound is really clear. when it mounts the volume dirty, then it is finally crunch and a distortion. I use it is to boost some of my guitar and also to clean my mess. I've had two months. I really looked for a good transparent boost, Zvex has fait.Bon is a bit expensive but if you order it through the states it is honest. I think the quality is excellent which justifies in my opinion took a little higher. Go to the site to see the video of the pedal. (Http://www.zvex.com/effects.html/) Also feel free to look at others. Zvex I feel that these will replace some of my pedals. Conclusion I believe that we can not do better as a booster. It manufactures a hand pedals & painted by hand. Mine is a photo of audio fanzine. Configuration is very simple as there a knob. The sound is easily obtained more than child's play, the more you open the knob over a question in the post. For my part, I use it as a booster it works perfectly. I think the "Super Hard On" can agree a lot of style of music since its function is to signal Bosst you. It can be used quite a guitar with single or double coil pickups. With regard to the sound, the more you turn the sound becomes more strong. From the middle it starts to get saturated, which become more and more rock Texas to maximum volume. I use it for over a year. There is nothing I dplaise on the pedals, can be the fact that there is no external power supply to power with an adapter. The report is good quality-price, given the quality of the pedals. With the exprience I Rasht this problem without any pedals.